In an ever-changing corporate landscape, employees equipped with the right skills and a contemporary understanding of business strategy are increasingly likely to progress in their careers. Studying an MBA will assist you in gaining a competitive advantage as you navigate your professional advancement. VU Online offers career-based education by undertaking real-world learning through units such as Strategic Management and Business Policy as part of the Victoria University (VU) Online MBA postgraduate degree. You will draw upon, and further hone, top-level management and problem-solving abilities – attributes that are recognised as among the most critical and in-demand business skills of today, and tomorrow. 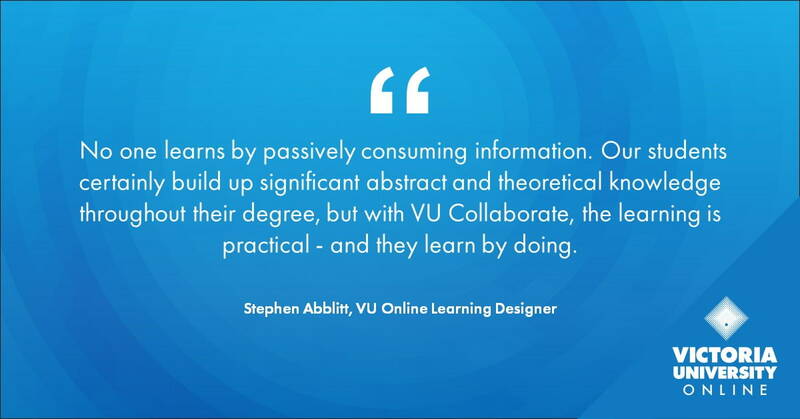 VU Online learning designer, Stephen Abblitt, who is part of the team behind the design of VU Online's learning platform, VU Collaborate, says problem-based learning (PBL) – emphasised in VU Online's MBA coursework and facilitated by VU Collaborate – is a hugely successful technique for engaging systems. “We help students use an online MBA to set themselves up for where they want to be in their career, whether it’s to move upwards, sidewards or even to start their own business,” Stephen says. 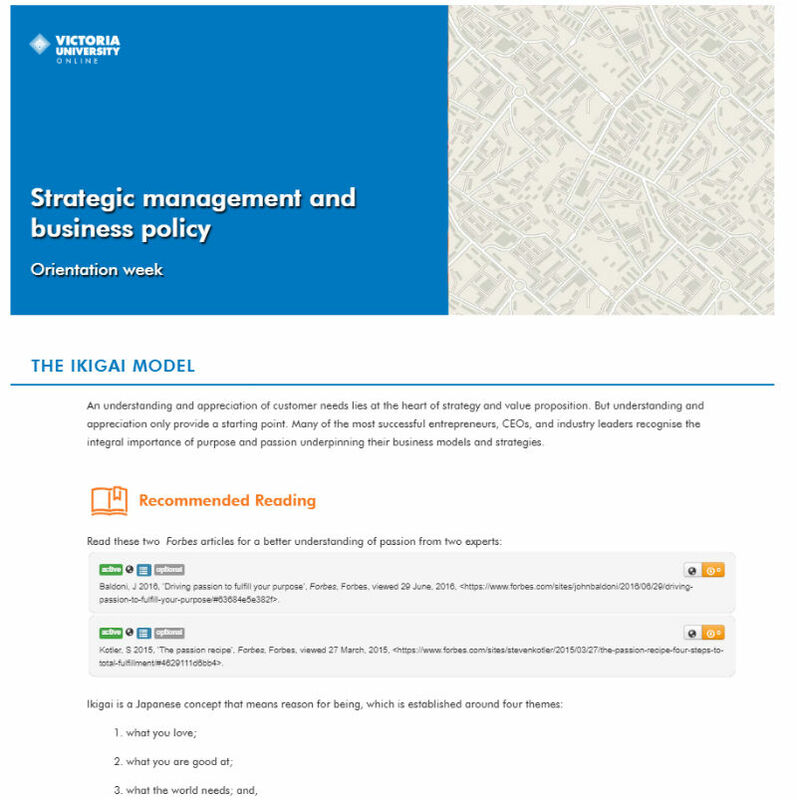 The Strategic Management and Business Policy unit is an excellent example of real-world learning. You will build on your own prior knowledge and professional experience, then explicitly link course outcomes to current your future career goals as you apply new knowledge and skills in your workplace. We all seek to find the ideal balance between the demands of our job, family and passions. To explore the principal elements of external and internal business influences, and determine how to respond to current complex issues, you will use the Ikigai model – the Japanese concept that translates to ‘reason for being’. It brings together what you love, what the world needs, what you can be paid for and what you are good at. It is often referred to as ‘enlightened entrepreneurship’ and has been successfully embraced by many successful CEOs, including Apple’s Steve Jobs. The MBA unit uses the Ikigai model as a framework for reflection and practice. By critically reflecting on your own individual Ikigai at the start of the unit, you will identify your passion, mission, vocation and profession, and pull these together to inform your business proposal, which comprises the unit's major assessment. Building an advanced body of skills and knowledge to be able to plan and problem solve in real-world professional situations is a central learning outcome of the Strategic Management and Business Policy unit. Experts continually advocate that career preparedness and employability are linked to an individual’s ability to recognise, and adapt to, differences in the workplace. VU Online’s approach introduces you to rich and varying perspectives on key business topics from a wealth of academic experts and industry leaders. Student-academic and peer-to-peer interactivity via discussion forums, reflective blogging and virtual seminars, promote the exploration of multiple perspectives and your own professional experience. By challenging assumptions and preconceptions and engaging in online discussion and debate, you will develop and draw on analytical and problem-solving skills before applying this knowledge to compose and refine a unique business proposal throughout the course journey. ‘Soft’ skills, especially communication and collaboration skills, are continually referenced as the most valued professional skills in our ever-increasing digital world. However, a recent survey by the Wall Street Journal found that 89 per cent of executives find it difficult to recruit people with these qualities. VU Online's Strategic Management and Business Policy MBA unit emphasises the development of these key attributes through the self-determined, problem-based learning course design, supported by VU's Online learning environment, VU Collaborate. You will engage with the subject matter through video, podcasts, live seminars, reading and supporting activities in a complex and critical way. You will then use peer-to-peer communication and analysis to solve specific problems in study groups. “VU Collaborate provides a highly social and collaborative experience. There are numerous opportunities to engage in dialogue through chat sessions and virtual classrooms – formal and informal – and run online study groups,” says Stephen Abblitt. In the online MBA, for example, there are three live seminars in every unit. While you can access these seminars after the event, participating live provides unique access to experts in the field. “This is an opportunity for the entire cohort to come together to hear from academic and industry leaders, to ask questions and hear about the real challenges faced by the people who have achieved what they want to achieve in business,” Stephen explains. "Alternatively, students can watch the seminars in their own time and still benefit enormously from the discussion." 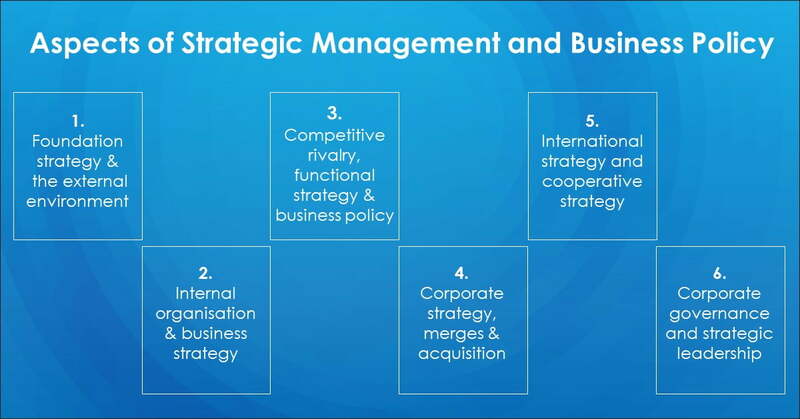 The entire VU Online MBA and specifically the Strategic Management and Business Policy unit provides current and relevant case studies to increase your engagement with the critical analysis of relevant business challenges facing industry leaders. “We set students up with an authentic and challenging problem they would likely encounter in their professional lives and use that as a focus for learning,” Stephen explains. With progressive, successful businesses placing increased value on employees who can demonstrate vital skills such as problem solving, critical thinking and adaptability, the most important investment any employee or entrepreneur can make to further, or change their career, is in their ongoing learning. Learn more about our 100% online MBA degree, which features Strategic Management and Business Policy as one of its first units.